In the wake of Hurricane Harvey hitting Houston in late August with record-breaking rain and floodwaters, hundreds of thousands of vehicles, including new cars waiting on lots to be sold, have been irreparably damaged, or totaled. With Irma bearing down in early September, hitting additional populous areas of Florida, thousands more vehicles will be damaged or deemed total losses. According to Alex Davies, transportation reporter for Wired Magazine, within days of the hurricane strike insurance companies had already received about 100,000 claims related to cars damaged by Harvey, 75 percent of them totaled. CNN Money writer Danielle Wiener-Bronner reported that Cox Automotive, a conglomerate of brands including Kelley Blue Book, estimated that between 300,000 and 500,000 vehicles in the Houston area could have been damaged by Harvey. A USA Today article written by Nathan Bomey raised the number damaged to 1 million in the Houston area alone, and CarFax estimates that half of these flood-damaged vehicles may return to the road. 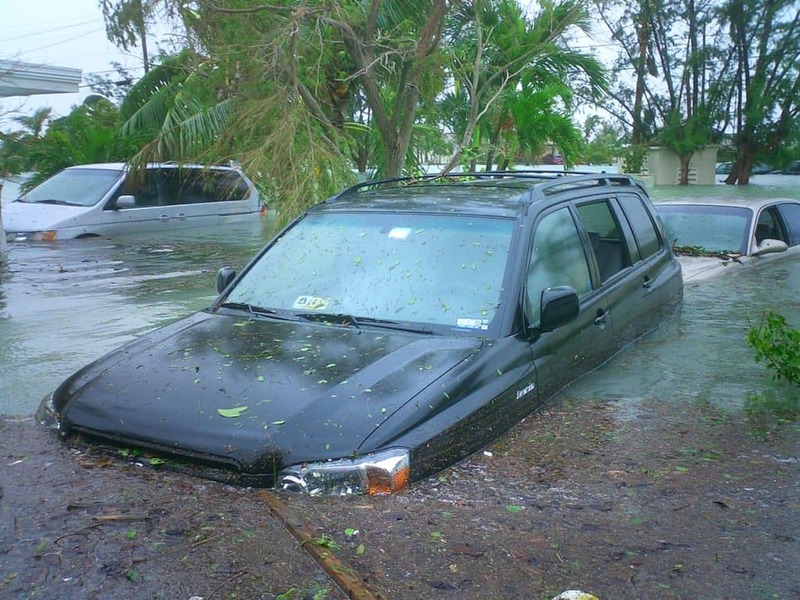 Automobiles that have been submerged in water—partially or totally—are no longer reliable. Over time, they could cost thousands of dollars to repair and upkeep. If you are in the market for a used car, beware that more flood-damaged cars than ever will be on the market in coming months. Historically, most are privately sold, away from where the damage occurred, to unsuspecting buyers who are less likely to follow precautionary steps and who may also have been offered a bargain price. Some flood-damaged cars, or “flood cars,” go to auction while some are sold privately. When an insurance company processes a claim for a totaled car, its car title becomes a “salvage” title, and the documentation is marked as such. These cars can end up at auction to be purchased for undamaged spare parts…that’s where they belong. Used-car dealers also purchase “salvage” titled cars for refurbishment and resale. These cars’ titles are clearly marked as “salvage” so the buyer knows what they’re purchasing. However, with 1 million damaged cars from Harvey alone and 15 percent of these uninsured, more damaged used cars will be available, and they may show up for sale anywhere in the country. Selling a vehicle or processing a claim through insurance may not be the primary initial concern for people hit hardest by hurricanes, as they have more important priorities such as repairing or rebuilding homes and getting back to work and school. 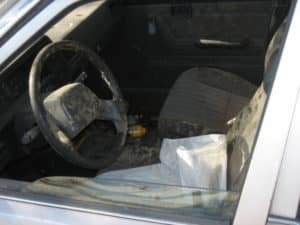 As such, dealing with the damaged vehicles may be on a back burner for overwhelmed insurance companies as well as car owners, so these damaged vehicles may not reach the market for several months, perhaps well after the event is top of mind to potential buyers. Furthermore, flood-damaged car titles that have been repaired for resale sometimes get cleared illegally in a “title washing” scheme and subsequently sold without the “salvage” brand by unscrupulous sellers. Uninsured vehicles, which Davies reports to Wired Magazine represents 15 percent of Texas car owners, are particularly susceptible to these schemes, as the owners will not receive insurance payouts and may try to repair the damage and off-load them, sometimes at bargain prices, to recoup their loss. As such, we recommend performing a rigorous inspection of the vehicle on your own or taking the vehicle to a trusted mechanic for a comprehensive review prior to making a purchase, even months after major flood events have occurred. For the most part, what to look for is common sense, but flood damage may not be top of mind to buyers thousands of miles from the hurricane occurrence, so researching, checking, and inspecting are critical for all used-car buyers. 1. Check a vehicle’s title history using the National Insurance Crime Bureau’s VinCheck, the National Motor Vehicle Title Information System or a commercially available vehicle history report service, such as Experian or Carfax, etc. Reports may state whether a vehicle has been flood damaged. Following these steps won’t guaranty you’ll find evidence of flood-damage, but they give buyers some key indicators that will help them avoid a potentially costly purchase mistake. The primary message regarding flood-damaged cars is buyers beware. Do not buy a flood-damaged car. At CarLotz, we aim to provide the most comfortable and transparent car buying experience possible, and other reputable dealerships will avoid selling flood-damaged cars. That said, it’s important in any event to keep an eye out for potential flood damage, so we hope the inspection tips above provide a useful guide for all car buyers.